I am no Picasso here…. 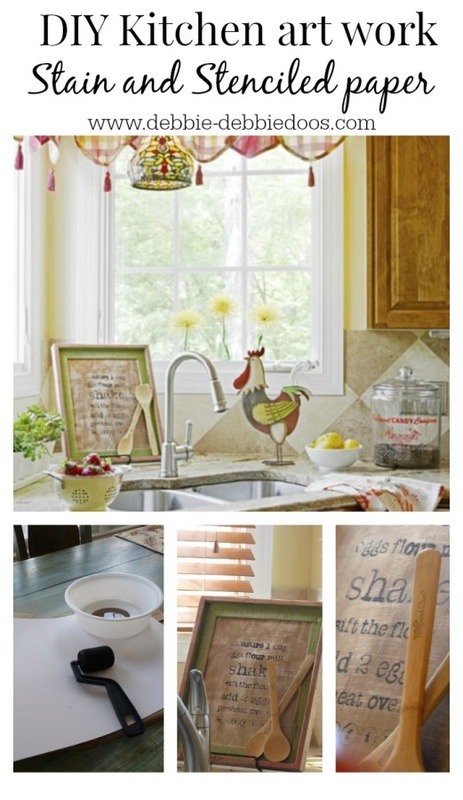 Today I am sharing a diy Stencil kitchen art work craft anyone can do. Come with me and I will show you the way. First take a trip to the Hobby shop. wherever you can find craft supplies. I actually painted the paper a rustic gold color with craft paint. Once dry I lightly sand papered it for that rustic distressed look. The paper I used is actually more of a cardstock thickness. That as well you can find at the hobby or craft shops. 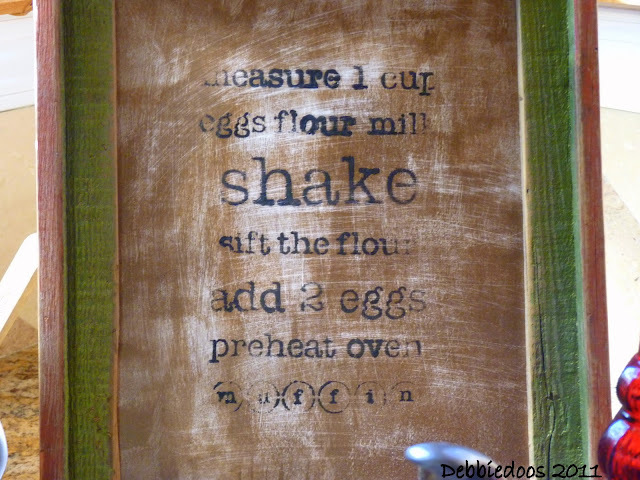 I then stenciled with the cute recipe, this came as a sheet with this recipe. 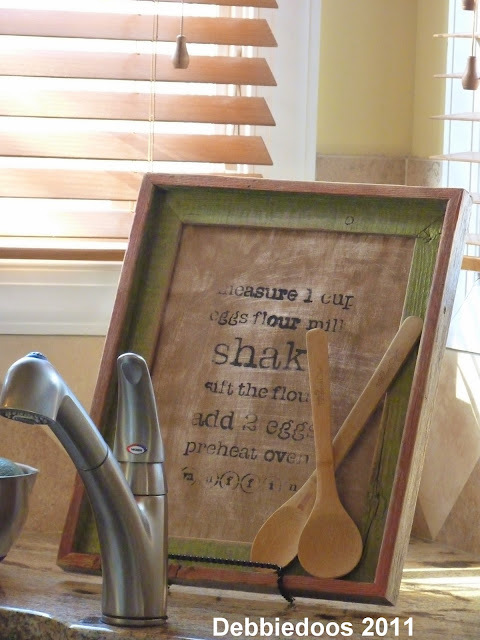 The recipe stencil came from hobby lobby and I have since used this a thousand times over. For Tea towels, crafts and more. It actually is a running joke now in the family. The fact that the recipe makes no sense partly attributes to the joke. As you can see I also painted the wood, with red and green and then sanded the frame as well. Again, only with craft paint found just about everywhere now. I added the wooden spoons just for a little something. Those just rest on the frame. It really makes a cute art attraction in the kitchen. This project cost me $12.00! and I enjoyed every bit of it. Cute project! Perfect for your kitchen. 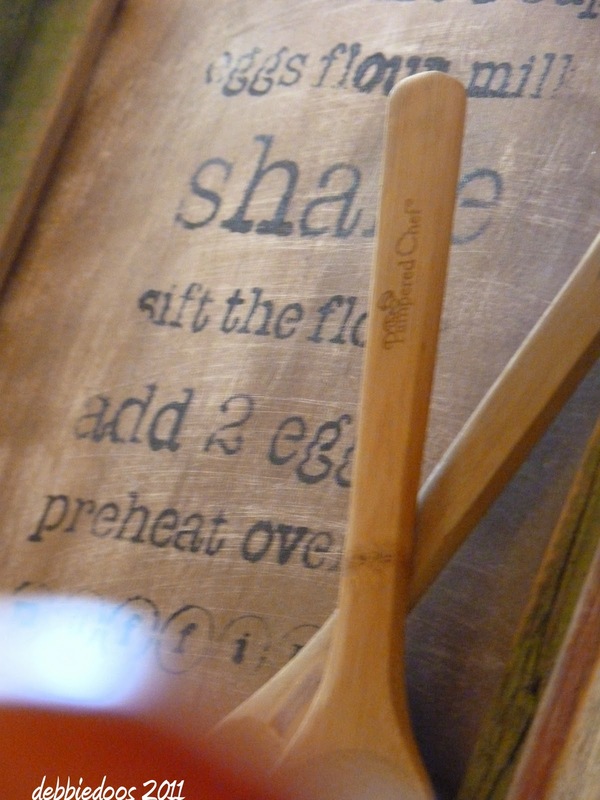 I especially love how you displayed the wooden spoons on the edge of the frame for a bit more texture. Thanks for sharing. Oh Debbie, I absolutely love this! You did a super job. So adorable! Just loved this! Thanks for sharing (I found you at CSI). This is darling and I love the colors you used. I also love the color of your table. Did you do that? First, let me say hello, second, let me say I love Hobby Lobby, it is the most exciting store in the World for me!! Do you know about signing up to get their e-mails, so you get a coupon every week for 40% off one single item, that is not on sale!! Third your Project is awesome, 4th I wish we were neighbours!! Keep up the great Blogging you were born to blogg!!! Go Girl!! Super cute! When I think of stencils, I think of 80's ivy stencils…I guess I need to take a trip down the stencil aisle at HL because your sign is adorable! Love it! Is there no end to your creativity???????? How can I get a dose of your energy? Absolutely lovin' all the new stuff on your blog and new things you are doing. Please stop in and see me sometime. So cute. I am going to have to that one for sure. I love all the things you come up with. Cute Debbie. MAN..I wish we had a Hobby Lobby!! The stencil queen strikes again!LOL! I love that Debbie! So creative and fun and just perfect sitting on the counter. That would make a really neat gift too…maybe packed up with a kitchen towel and some fun olive oils and things. You are awesome! This is great! I love it!! I would have never thought of that. Love the colors and sanding. Now that's a really cute project. It looks way more expensive than $12. Great job. That came out so cute! I wish we would get a Hobby Lobby. I am jealous. that is so pretty, it looks like it came straight out of a Pottery Barn magazine. Wow, Debbie! That is beautiful. Oh Debbie, how fun is that stencil project. It looks great in your kitchen. Very nice Debbie! And, you found the perfect spot for it! Ohhhh schnikey, this is gorgeous!!! I love it! How did you come up with that paper technique? We don't have Hobby Lobby here, sniffle sniffle:( Maybe you should open an Etsy shop! This would be awesome to do with a wine label background also (hint hint). What a cute project! You did good. what a darling project! 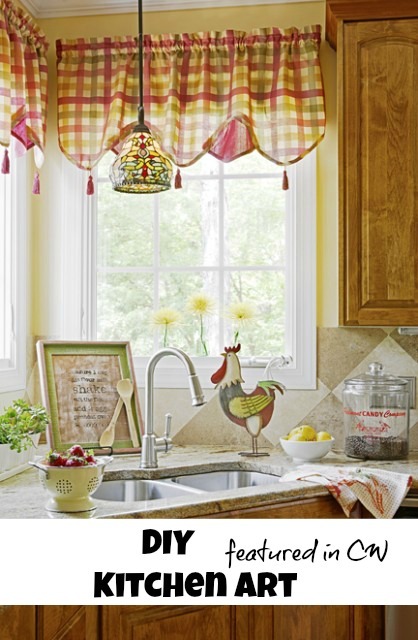 it's perfect in your kitchen! i just love hob lob…don't think i've ever left there empty handed! Wow who would have thought of that technique, why Debbbiedoo would 🙂 It looks great and very creative as usual. Thanks for your inspiration. Debbie Doo…you are one creative girl!!! Love this! Look at you! That looks fabulous! I love that!!!! Debbie, you are out doing yourself!!! That is seriously a super neat project! Great job, girl! Being happy with your final result is the best part of the project! I'm glad you shared it with us. Stop by if you get a chance. I just posted the BEST tablescape ever! Very cute project Debbie! I had to swear off stenciling because I was becoming obsessed. If I fall off the wagon, I'll blame you!! Debbie, this project looks great. Almost looks like burlap. What a good job you did. Oh that is Cute, Debbie!! Love the completed look with the spoons too! That is so creative. I love it. Great job! This is so cute and simple! I really want to try it out. Debbie, I have not done much stenciling…Hard to believe! Did you do it letter by letter stencils or did you print it all out and then cut out all the letters and stencil? Love it! I consider it a good week if I can get to Hobby Lobby…then this week is a great week – 2 trips to HL!!! 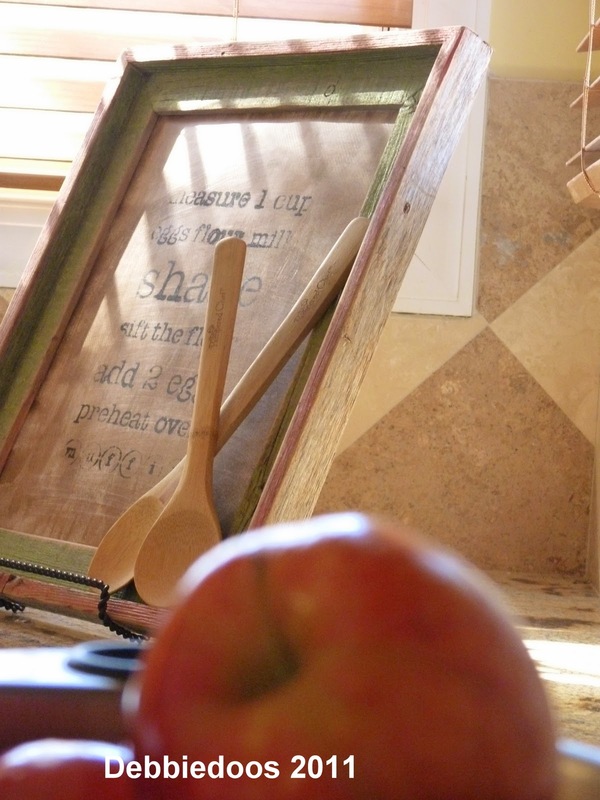 Love your sign…so rustic and fun! Great job! Thanks everyone. This was a one sheet stencil that had this entire recipe on it. I used a roller to stencil it on the paper, it was neat and easy. Thanks for the encouraging comment on my train themed bedroom post … and for the new follow too – it made my day! I had to click follow here – you have a great blog!! Hey girl, just wanted to let you know I featured this totally awesome project over on my blog! You crafty little thing you!!!! I love it 😀 It's so simple and that makes it even better! Hello lovely friend! Just comin' back over to say thanks for linking this up to the Inspiration Friday party this week! Be sure to come back today to enter to win a $25 Overstock.com gift card! Debbie, that is too cute!! I can't believe you did that! You should make more and sell them on etsy! good job! This is just as creative and cute as can be, Ms. Debbie! I super big heart love this. How cute! I love this idea! The wooden spoons added the perfect final touch! You make us see stenciling in a whole new way! Very cute project Debbie. It turned out wonderful. So cute and rustic! I love it! Love this idea! The added wooden spoons rock. You are so creative and talented! Wonderful job Debbie. I LOVE THIS PROJECT!!!! I'm headed to HL in the morning so I'm going to see what I can come up with following your inspiration! How cute is that, Debbie! I love that for a kitchen display. You're full of creative ideas, Debbie! This turned out fantastic.. I've just read about Beatrice, but when I click on the comment, blogger said can't find the blog! 🙁 I swear I saw Beatrice in many different outfits too..
What a super cute project! You must have a lot more hours in the day than I do or taking Super Vitamins. You create so many fab projects! I love how this came out! You did a great job! How creative, adorable and you can say I made it myself. Never would have thought to stencil a recipe. Thanks for stopping by my blog and I am your newest follower.